Through the poster, the workers also thanked Congress president Rahul Gandhi for inducting Priyanka Gandhi Vadra in active politics. Elated with Priyanka Gandhi Vadra joining active politics, Congress workers in Raebareli today put up posters to praise her. The enthused workers compared her with former prime minister Indira Gandhi and Goddess Durga. 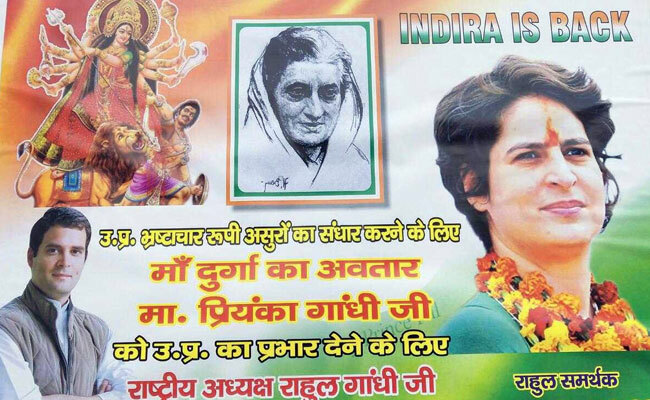 "To kill the demon of corruption in Uttar Pradesh, Priyanka Gandhi has come forward in the avatar of Goddess Durga," a poster by Congress workers in Raebareli read. Rahul Gandhi today announced his sister Priyanka Gandhi Vadra's appointment as Congress general secretary. He has entrusted his sister with the tough job of turning around their party's prospects in Uttar Pradesh. Jyotiraditya Scindia-- the Madhya Pradesh stalwart who played a pivotal role in wresting the state from the BJP last year-- will help her in the task. The move comes weeks after Mayawati and Akhilesh Yadav snubbed the Congress from their alliance in Uttar Pradesh. It was a major blow for the party as it was trying to build consensus on a pan-India, anti-BJP alliance with regional parties for the upcoming Lok Sabha election. Priyanka Gandhi Vadra has campaigned for the Congress in the Nehru-Gandhi bastions-- Amethi and Raebareli-- but largely remained away from active politics. However, following a string of losses since 2014, the workers had been demanding a greater role for her in the Congress. Congress sources said she could contest from Raebareli, her mother Sonia Gandhi's constituency, which she had nurtured for years. Her entry into Uttar Pradesh politics is seen as a morale booster for the Congress workers, who recently saw wins in Rajasthan, Chhattisgarh, Maharashtra, after being decimated in elections by the BJP for over four years.